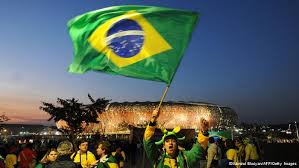 The FIFA World Cup is coming to Brazil this year for an event that will be watched by billions of viewers worldwide and attract around 600,000 tourists to the country according to International Business Times. It is an opportunity for Brazilians to showcase their culture, food and soccer skills in what is sure to be an amazing spectacle. But how can you use sports teams or events to benefit your business? 1. Get colorful by putting up flags or merchandise to show your support. This will make fans feel welcome when the walk in the door and happy to stay with you. 2. Partner with the event or team so fans can see that you are an accommodation preference of that team or organization. *Approach the organization and tell them how excited you are that they are hosting such an event and ask if they could include a link to your website from their page. Incentivize them and offer a commission on rentals booked through their website. 3. The website where fans buy tickets from can also have a link to your page which will increase the amount of traffic your page gets. *Including specific references on your website about the event or your team will make fans trust you more. 4.Wearing the team jersey or colors leading up and during the event will show that you care about what everyone has come to town for. *Keep your image inventory stocked with pictures that can cater to the main sporting events in your area. Catering to sports loyalties is an easy way into the hearts and trust of many. 5. Make sure you have adequate Customer Relationship Management (CRM) software so you can reach out to your previous customers when you think an event is coming to town that might be of interest to them. 6. Offering a Chauffeur, laundry or cooking service could be the extra incentives someone needs to choose your property over the others for their getaway. Differentiation is key and a crucial way to make your rental stand out from its competition. Whether there is a golf tournament, a high school state tournament, a bowl game or another college event coming to your area it can be used to your advantage to attract more people to stay in your accommodation.